In my Bible, this passage has a bold-print heading that says it’s about ‘the Syrophoenecian woman’s faith.’ But I’m not exactly sure what the editors think ‘faith’ is in this story. 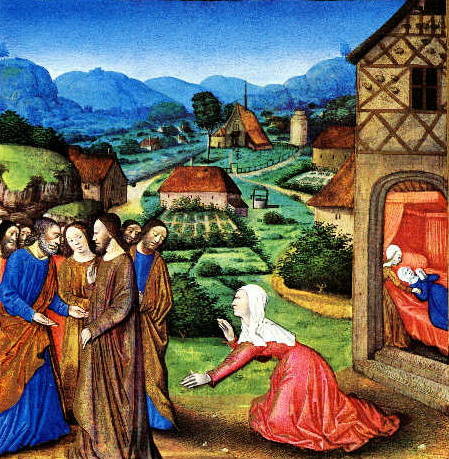 Are they referring to the way the woman threw herself at Jesus’ feet? Maybe to them that’s ‘faith’—to want something so much it drives you to your knees. Faith or not, it was high drama, but Jesus still said no. Or maybe even “Jesus the bigot.” After all, his first impulse was to withhold from a foreigner the health he’d given to his own people, and that sounds like bigotry to me. But maybe not. Maybe he intended to help her all along and was just testing her first, upping the emotional ante to make her strut her stuff, to show what she was made of. I had an Italian Catholic grandmother whose daughters, my aunties, were talking about birth control over coffee in her kitchen one day. They were confessing that they felt guilty about using the pill. ‘Oh, don’t worry about it,’ she told them. Maybe Jesus didn’t really mean it either. Maybe when he said no, he was just toeing the public party line. Or maybe I’m missing something because I’m just speculating. Maybe more exegesis would help. Maybe a word study. You probably already know this, for example: Jesus didn’t say ‘dog’ exactly; he said ‘puppy.’ The slur he used for that woman and her kind had endearing overtones. Feel better? I don’t. Jesus’ answer was still no. There’s no way around it. Unlike the pope, he meant it. His ministry was not for the likes of her. 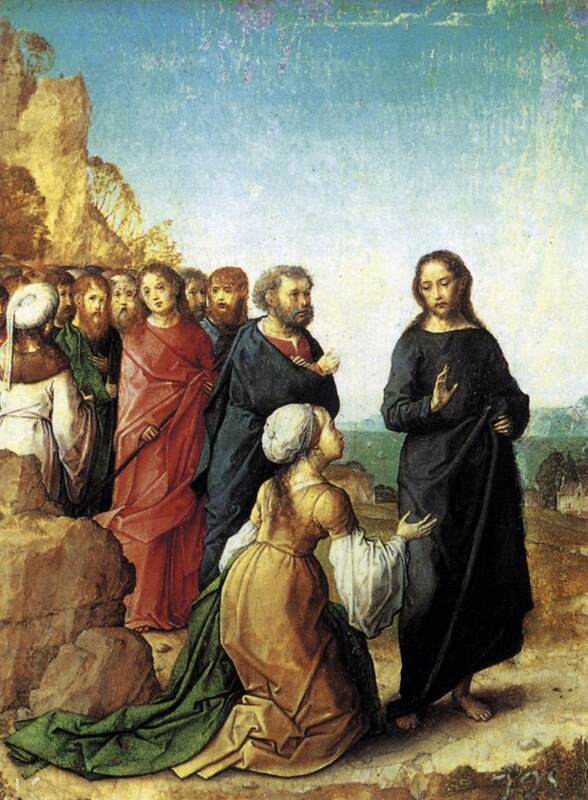 But the editors of my Bible called this story, ‘The Syrophoenecian woman’s faith.’ She’s the one who interests them. So let’s get back to her. For her daughter’s sake she’s willing to accept Jesus’ disdain, but only up to a point, and she doesn’t have to like it. She gets annoyed, gives as good as she gets, does whatever it takes, and gets what she came for. She’s fabulous. And she reminds me of God. Now, when we hear gospel stories we tend to look for clues to the character of God in what Jesus says and does. We tend to identify with the uncomprehending disciples, the sick in need of healing, the lamb who goes astray, the prodigal child ashamed of his life. But what if in this story Jesus represents us—myopic, a little smug and in need of a breakthrough, people with all the answers? What if in this story Jesus stands for us—constrained, seeing the world in far too circumscribed a way, and thus inhospitable, ungracious, unable to entertain new persons and new ideas? What if Jesus stands for the way we act when we’re scared, the way we cling to what we’ve always known, the way we dig in instinctively to defend what worked before when the first serious challenge to the usual arrangement threatens to blow old assumptions out of the water? 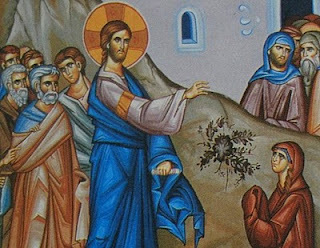 Maybe in this story Jesus is us—human beings in need of breakthrough. And maybe the woman is God. But if she is God, a patient, tender and compassionate God she’s not. Not the nice God we prefer—understanding, open-handed—who gives us space to fail and grow. This God’s willing to take insult and suffer our neglect, but only up to a point, and she doesn’t have to like it. She gets annoyed, fed up, gives as good as she gets. She’s the God who intrudes and won’t budge until we throw in the towel and give her what she wants—namely, that we change our minds, enlarge our vision, expand our mission, and share a life of utmost generosity with all comers. She will do whatever it takes to get what she wants from us—a commitment to heal her suffering daughters and her ailing sons, to extend the healing beyond our own kind, beyond our well-known and well-defended boundaries. Our God is gentle and kind and patient, the Bible says. And that’s a God you and I need and depend on. But I think the Bible says that God is also a Syrophoenecian woman who won’t take no for an answer. Whatever she is, she is no shrinking violet. She makes a formidable claim on us. And she continues to do whatever it takes to create in us an ever larger heart, to motivate us to an even larger embrace of the world. Her indefatigable purpose is healing, the integrity of life, justice in the nations; and she will keep at it until, in Isaiah’s words, the wilderness is in bloom, eyes shed no more tears, and no one and nothing wicked accosts us on the highways of life. She brooks no vacillation on our part, no doubts about whether we can or should grow and change and commit to her cause. She has no personal space issues either; she is so near she came in the flesh and now indwells us. She will not cease to breathe down our necks and beg at our feet until we have to go and tell her story, until we are not the only ones who give her what she came for, not the only ones who throw in the towel to the saving grace she offers, not the only ones who see her coming and rejoice. This entry was posted in Marginal Notes, Miscellaneous Commentary on September 17, 2012 by sicutlocutusest. This story has bothered me for a while. Thank you for being honest with your struggles. Thank you for re-framing it, thank you for opening it up and well, just thank you. Never heard this take before. Like it a lot. Wow, I love this one, Mary. Oh so glad you do. Thanks!